Thank you for your support and faith in us and the demand for us to lead our union, Local 135. This is the first time EVER in the 30 year history of Local 135 that two of the most experienced, & knowledgeable Union Representatives of this magnitude have brought together the most talented and selfless members to come forth to be the vanguard for our union. We will restore honesty, ethics and integrity into our dealings with members that need care, as well as standing as a powerful united voice: to fight and negotiate powerfully for contracts that are in YOUR best interest. Together we will create and build an infrastructure to educate, innovate and empower our members to organize and lead our Union Local 135 to the next level of labor evolution. We will, from this day forward, welcome, include and connect all unions of the AFL-CIO, labor allies, community organizations, academia and faith based groups to our UFCW union family instead of alienating them – union means UNITED, not separated! It is important for the people of our union and country to come together to rebuild what has been fractured. We are a powerful force when we all join together! You, the members of United Food and Commercial Workers Union Local 135, have been demanding the right to choose and elect our leadership. You demanded that the process of Union Officers’ Election be allowed to commence, in accordance to the UFCW Bylaws and Constitution Article XII. Because of you and your involvement in the epic petition drive for our Officer’s Election, that time is now. Solidarity has come to life, and those who are corrupt and driven by egocentric agendas are fearful and felt the pressure brought upon by your petition signatures. We thank you all for making this election possible, together we will be victorious. 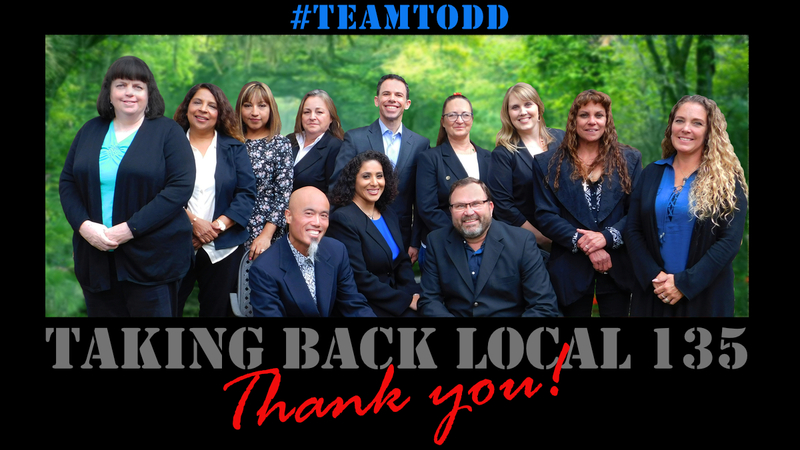 Team Todd wins the election on Saturday, December 15th after full count of all ballots including challenged ballots.